He’s played for Shattuck St. Mary’s and storied Edina HS of Minnesota. The Muskegon Lumberjack and US National Development Team came calling and he stepped up admirably in his short stint with both teams. On Sunday June 30th, Connor Hurley will be looking to put on one more hockey jersey at the 2013 NHL Entry Draft. Hurley has been lauded as the best player coming out of high school this year. He’s a tremendous skater that possesses terrific vision and has the hockey sense and IQ to boot. He’s agile and quick on his skates. Hurley’s transitioning is top notch along with his tape-to-tape passing ability. He will be attending Notre Dame next season where he needs to build up his upper and lower body strength. When he does so, he will be even more dominant physically than he has already shown. He won’t strike you as a defensive forward, however he does have an above-average defensive game. He’s relentless in his pursuit of the puck and goes to the play instead of waiting for it to come to him. An adept backchecker, Hurley uses his speed to get back to the defensive zone quickly and cut down passing lanes. All this has made him garner interest from scouts and he should be a very high pick come Sunday. Hurley has been climbing up the rankings of late. He could very well make it into the late 1st round, but he will not fall past the 2nd round. 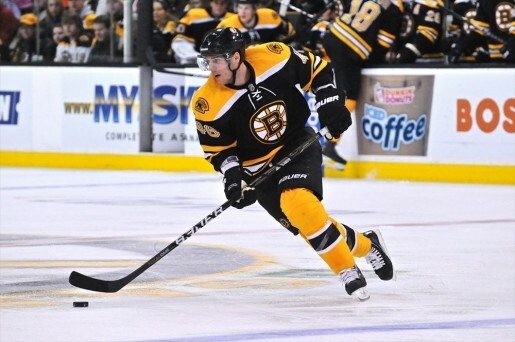 -Hurley plays a very similar game to David Krejci. He sees the ice well and is more of a set-up guy than a goal scorer, even though he can do that also.